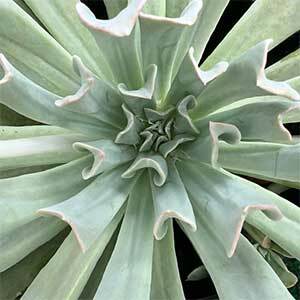 With leaves that are are a different shape to most, ‘Topsy Turvy’ is an appropriate name for this Echeveria runyonii hybrid. The leaves tend to curl upwards and somehow look as though they are upside down. This is a variety has been around for a while and is popular with collectors. Attractive waxy blue green foliage on a neat rosette forming plant make this an excellent specimen plant. Echeveria ‘Topsy Turvy’ can be grown in a container, and in warmer climates it can also be used outdoors in the rock garden or as a ground cover plant. Typical orange flowers in summer rise above the foliage. The plant will form offsets and these can be removes to propagate the plant or simply to keep ‘Topsy Turvy’ as an individual specimen. Free draining cactus and succulent potting mix. Water requirements are low. Water when dry from spring through summer. Less water in winter. If growing in the ground, very little extra water will be required. This is a plant that has low fertiliser requirements. A little liquid fertiliser in spring is about all that is required. You will need to repot every 3 – 4 years. Potting mediums become exhausted and break down over time and this causes watering / drainage problems as well as exhausting nutrients. Pull away dried dead leaves as they appear, wait until they pull away easily. Height – To around 20 cm in flower. Foliage – Fleshy and blue / green.